Zen-Ray ZRS HD Binoculars: Why Consider Them? What's so great about Zen-Ray ZRS HD binoculars? When a reader/friend strongly urged us to get a Zen-Ray ZRS HD binocular and test it, the suggestion met with some resistance. We hadn't used a Zen-Ray binocular before and we tend to avoid jumping on bandwagons unnecessarily. And while we were finding increasing numbers of people talking about them, we wondered if they were in the binocular market to stay or not. We had a problem, however. One of the criteria we typically use in selecting a binocular for review is whether or not a binocular is likely to provide a solid value for the price. We were looking for optics that we felt we would probably be really enthusiastic about as a result of testing them and we just weren't finding what we thought should be available. Perhaps you can understand how the suggestion to try the Zen-Rays would keep coming back to mind under those circumstances. We decided we weren't giving the company a fair shake without learning at least a little bit about it, so our researcher/historian dug in to see what information was available. There isn't much information about Zen-Ray available other than they are located in the Beaverton/Portland, Oregon, area! One thing stood out in our thinking and that was that we weren't seeing much advertising for Zen-Ray optics. In fact, when we checked Zen-Ray's Facebook page, we found they were saying they were too cheap to advertise in some of the outdoor magazines. That caught our attention! If they were too cheap to pay for advertising, it suggested to us that they were focused on keeping costs down and passing the savings on to their customers. That's the kind of philosophy that we've found a company typically has when it intends to provide value and grow slowly, but financially solidly. We started looking for Zen-Ray discussions in optics forums and found that the company has a reputation that's rapidly spread by word-of-mouth for 1) a high quality to price ratio, 2) being much quicker than most to implement changes based on customer feedback, and 3) excellent warranty service. How did such a company get started? When we later asked a Zen-Ray staff member about its start, we were told that several birders in the Portland, Oregon, area got together in 2006 for a birding excursion and conversation drifted to the "optics divide." The pricing of quality optics in 2006 meant that really good optics, with prices around $2,000 and more, were simply unaffordable for most. This optics divide meant that most folks, especially youngsters, were using binoculars of fairly poor quality. Simply put, there were no mid-priced binoculars providing build and optical quality that would rival the top tier binoculars. The customer comes first. Every customer is treated with respect and care. Zen-Ray relentlessly pursues continuous quality improvement. The identification of the product design which will provide customers/users the best quality for a fraction of the price of competing products is a top priority. 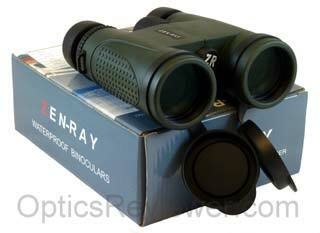 We ordered our Zen-Ray ZRS HD binocular in February 2013. What does ZRS HD mean, you ask? ZRS stands for "Zen-Ray-Summit." The HD stands for "High Definition" which should not be confused with the term "high density" which is sometimes used interchangeably with "extra-low dispersion" to describe particularly dense glass sometimes used in objective lenses. Zen-Ray is not the only company to use "HD" to mean high definition. 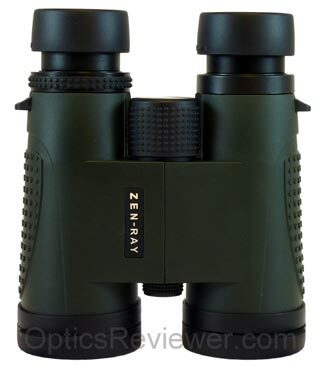 The Summit model was one of Zen-Ray's first binocular models and has been updated a number of times since its arrival was announced about mid-May 2006. Let's get started with our review then, shall we? We can't think of many binoculars at this price point which boast a magnesium-alloy chassis. Typically, we would expect either a good polycarbonate or high grade aluminum chassis in this price category, but not a magnesium frame. They're typically used for higher priced binoculars. The binocular-servicing optical technicians we talk with tell us that they much prefer working on binoculars with metal frames since they're significantly easier to work with. Another aspect in our favor as binocular users/owners is that magnesium is lighter than aluminum and thus contributes to the ZRS HD weighing in at only 23.6oz (669.1g) for either the 8X or 10X configurations. Using this binocular for extended periods doesn't seem to fatigue the hands or forearms significantly. This is another way of saying that thought and care seem to have gone into their design to ensure that they would be well-balanced. Those who have used front-heavy or back-heavy binoculars will almost certainly appreciate this more than those who haven't! This binocular is compactly built. To ensure that no one misunderstands, let's underscore that it's not a "compact binocular" — rather a full-sized binocular that's compactly built. It's only 5.5in (14.0cm) tall, with the eyecups down, and 5.0in (12.7cm) from side to side. That's a comfortable handful of glass for most hands. As one would expect, this binocular has a standard thread receiver for a tripod adapter located at the front of the hinge. It comes with a threaded cap covering it for the sake of beauty, but turning it counterclockwise will unscrew it and allow you to use it with an optional tripod adapter. We recommend making the modest investment in a tripod adapter and affordable tripod to really get the full benefit of binoculars like this one. Until you've had a chance to see what's possible to view when binoculars are immobilized, you're not likely to believe what's possible when the tiny, involuntary movements of human hands are eliminated. We'll not go on at length about it — we'll simply tell you that we recommend it and leave it at that. The Zen-Ray ZRS HD binoculars are waterproofed. While we don't recommend dipping your instrument in a stream just because you can, it's nice to know that the occasional slip when crossing a stream isn't likely to result in internal fog that will play host to a fungus which will eat away at your lens coatings inside your binocular! To help prevent internal fogging and fungal growth, the binoculars are sealed with O-rings while being manufactured and a couple of spots left in the barrels where the potentially moist air molecules are purged from the binocular's interior with a dry gas before those remaining holes are plugged. Both nitrogen and argon gases are commonly used in purging binoculars — the box ours came in said that Zen-Ray uses argon in the ZRS HD model. The eyecups on the Zen-Ray ZRS HD are of the twist-up and twist-down variety and are metal reinforced for durability. They have an intermediate detent so that it's easy to keep them halfway up to accommodate those of us who like an intermediate eye relief length. The functioning of the eyecups on our test model was smooth and had a well-machined feel. We had no problems with them self-adjusting, as some have done, just when we were trying to watch something particularly interesting. The midway detent is at 5mm and at the fully extended position the eyecups on our test ZRS HD was about 8mm. Since our 8X42 configuration's specifications indicated 17.6mm of eye relief, the person familiar with personal eye relief requirements can determine how comfortable the ZRS HD might be on a personal basis. The 10X42 configuration's eye relief is less at 15.2mm and a person who wears eyeglasses may wish to determine before ordering if that's adequate for their needs. Our test instrument's center focus wheel had just a little bit of play in it. We didn't feel it was enough to dwell on at length, but mention it for completeness. Certainly, for the overall quality of build and optical quality of the ZRS HD, we felt that the amount of play was more than compensated for by the binocular's price. Our test instrument's focus wheel used just under 1.5 revolutions of the wheel to go from close focus to infinity. It's not bad and within what we're willing to accept. Our regular readers will no doubt recall that we beat a steady drum for about a single revolution of the focus wheel to travel from close focus to infinity. If you're not a regular reader here, you may be asking yourself why we might hold such a view. The reason for prefering a single revolution of the focus is because, although a higher number revolutions will wear out your fingers over the course of a day's outing and less than a single revolution typically means having to work hard at achieving a fine focus, a single revolution typically provides the best of both worlds: a reasonably fast focus without having to settle for a coarse focus adjustment. If you've ever spent the day scanning and more or less constantly adjusting your binocular's focus, you'll remember having worn out your fingers on the days when you had a binocular which required a couple of revolutions of the focus wheel to go from close focus to infinity! Of course, it's true that pushing it up to 1.5 revolutions allows a person to achieve a finer focus and we're willing to live with that. For those who have strong focus wheel turning habits, we'll mention that the center wheel of this binocular turns counterclockwise to infinity. On the box our Zen-Ray ZRS HD came in, it said that they were made in China. It seems to us that Zen-Ray must have a very good working relationship with the manufacturing plant, since it appears that they're able to make design and manufacturing changes quickly and seem to have a good quality control relationship with the manufacturing plant's management. While the physical build of a binocular is very important, we get a bit more excited when we start talking about optical performance! 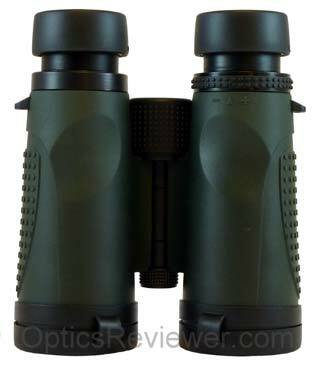 Our 8X42 Zen-Ray ZRS HD binocular had a significantly better field of view than most binoculars at its price. The 393ft view at 1,000yds (125m at 1,000m) gave a satisfying breadth to what we were watching. That calculates to about a 7.5° angular field of view and that's not bad! This is the type of field of view that anyone watching action sports or racing would want. This is the breadth of view that birders and airplane spotters crave to be able to quickly find a bird/plane in flight. This is the view that hunters require when watching for activity from a blind or stand or scanning the territory in front of them as they move. This is the type of field of view that we wish more optics companies understood the importance of and clearly, when it comes to the binocular we tested, Zen-Ray "gets it." The central area within a binocular's field of view which provides sharp resolution of details is often referred to as the binocular's "sweet spot." As one's view edges toward the sides of the sweet spot the fine lines (or edges thicker lines) in a viewed image begin to soften and, as one gets further from the sweet spot, they begin to blur until they no longer provide a usable image. This is normal in most binoculars and the binocular's focus can usually be adjusted so that details in these soft or blurry areas are clear, although the details in the sweet spot will then be softened or blurred. We found that the Zen-Ray ZRS HD binocular which we tested had a good, sharply resolved sweet spot to about 50&percnt; of the field of view's radius — at which point the fine lines and/or edges of thicker lines began to almost imperceptibly soften. It wasn't until about 72&percnt; of the radius that the details started to blur noticeably. We found that the resolution of the instrument we tested was good and about the same as or better than the other binoculars in its price category with which we compared it. 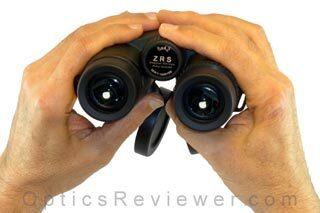 The ZRS HD binocular allowed us to readily see fine details in viewed images. 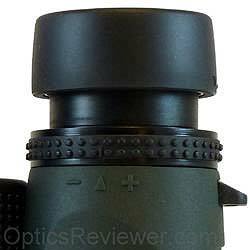 The exit pupil on our 8X42 test binocular is specified at 5.3mm and the 10X42 at 4.2mm. Either of these is good for those occasions when you're going to be using your binocular for extended viewing periods. While we do use and recommend smaller exit pupils for specific purposes, such as in compact travel or backpacking binoculars, our experience suggests that using a binocular with an exit pupil of less than about 4.0mm for extended viewing results in uncomfortable eyestrain. Our ZRS HD was good with chromatic aberration, or color fringing, most of the time. We did find that we were able to induce fringing on dark electrical wires or branches viewed against a bright sky, resulting in a purple-colored fringe above and a slight yellow one below the dark object. It's fair to note that the chromatic aberration wasn't obvious and we didn't feel that it impaired the usability of the binocular in the field. We felt that our test binocular was similar to or better than the other binoculars in its price category which we compared it with. We don't believe that the fringing is likely to bother or even be noticed by most people during practical use. We did not notice that our test binocular demonstrate any color bias, but it appeared to provide a neutral (not unnatural) color rendering with vibrant colors coming through when viewing brightly colored wildlife. Certainly, one would suppose that the prisms' dielectric coatings contribute significantly to this color fidelity. Not only do the ZRH HD's 40 dielectric prism coatings contribute to the color fidelity, but they significantly improve the low light performance of the instrument. Manufacturers have found that increasing the number of these coatings enhances the reflectivity and low light performance. Naturally, the prism coatings work in conjunction with the anti-reflective coatings on the surfaces of the lenses for low light performance and, as you might expect from its other optical features, this binocular is fully multi-coated to enhance its usability. We found that our test binocular was significantly better than roof prisms in its price category and approached the low light performance of significantly more expensive instruments. Those who enjoy wildlife in the hour or so just before the sun rises and during the twilight hour will likely enjoy the ZRS HD as much as we did. Our test binocular excelled in performing under strong light conditions as compared within its price category as well as with some significantly higher priced binoculars. While there were some shallow and close to 90° angles to the sun at which we were able to induce glare with our ZRS HD, it significantly outperformed its class in general. This will be of particular interest to those who enjoy the early morning and late evening hours when the sun is low to the horizon. It is also likely to be of special interest those who enjoy fishing and those who enjoy the beauty of nature when it's covered by winter snow. The manufacturer's specifications indicate a 6.0ft close focus distance for both the 8X42 and 10X42 configurations in this binocular. Our instrument's close focus measured 5.7ft (1.7m) and is well within our recommended 8.0ft (2.4m) minimum for bird watchers to use. The diopter adjustment is achieved by means of a ring located around the eyepiece on the binocular's right barrel. This is the adjustment to adapt the focus of the binocular's two barrels to the natural difference between a person's eyes. While the diopter adjustment on this binocular doesn't lock, it does the next best thing and provides a click adjustment. While we prefer a locking adjustment, we didn't have any trouble with the diopter adjustment being unintentionally changed during use. We were pleasantly satisfied with the perceived three-dimensional view which enabled us to switch our attention between objects at reasonably varying distances without the necessity of fiddling with the focus wheel for every minor change in distance. It has been our experience that many of the less expensive optics require more adjusting for even the smaller changes in viewing distance, but that's not the case in this instance. While we, perhaps obviously, needed to adjust the focus for significant changes in viewing distances, it was nice to be able to have the 3D effect and convenience. We're all just big kids when it comes to opening packages and seeing what's inside, aren't we? The carrying case appears to be made of a nylon-based material with a slightly fuzzy (but lint-free) back. The case has a double-pull zipper going around the front edge of the two sides and top which allows the front of the case to be fully opened to take the binocular out or to put it back into the case. There's also a flap that's comes over the top and fastens with Velcro onto the front of the case. The case has a nylon web adjustable shoulder strap attached with clips and D-rings to the sides of the carrying case. While there is a belt loop of what appears to be a plastic-type material stitched onto the back of the case and it's probably quite serviceable, we thought that putting weight on it might cause the stitching to cut through the plastic. We didn't use the belt loop. Also included in the box was an instruction manual and micro-fiber lens cleaning cloth. The neck strap included for the binocular is made of a soft neoprene or neoprene-like material and is wide enough to distribute the weight of the binocular comfortably. The ZRS HD comes with a rain guard to cover the eyepieces with in case you're caught out in a bit of rain. It's made of a durable feeling material which we suppose might be plasticized rubber. It slips neatly over the eyecups and is both snug and deep enough that it doesn't fall off. It's large and loose enough, though, that we didn't feel as though it took an unusual amount of time or effort to take it off the binocular when we wanted to see something. The rain guard has an eye on the right side for the neck strap to slip through so that it won't get lost. It also has an eye on the left side that's cut in the middle to allow for a person to either keep both ends tethered to the neck strap or only the right end. In use, however, we found that the left end of our rain guard didn't really stay attached to the neck strap and we were content to just let it hang from the right side of the neck strap. There were two covers for the objective lenses included in the box, too. While the rain guard was nice in that it was easy to take off and put on the eyepieces, we felt the lens covers were perhaps too easy to take off and put on — we opted to just take them off and leave them in the box to avoid losing them. We feel this binocular delivers optics and construction of significantly better quality than most binoculars in its price range and earns serious consideration by anyone considering updating or upgrading a binocular. Zen-Ray's Facebook page says that they focus on developing high quality, affordable consumer optics for birders, hunters, and everyone who enjoys the outdoors and nature. We love the Zen-Ray ZRS HD binoculars and we feel quite comfortable recommending them to any of our friends in these groups, but we don't stop there. Given the wide field of view, we feel they'll be great for plane spotting binoculars and for anyone wanting a good view at a sporting event or race track, too. 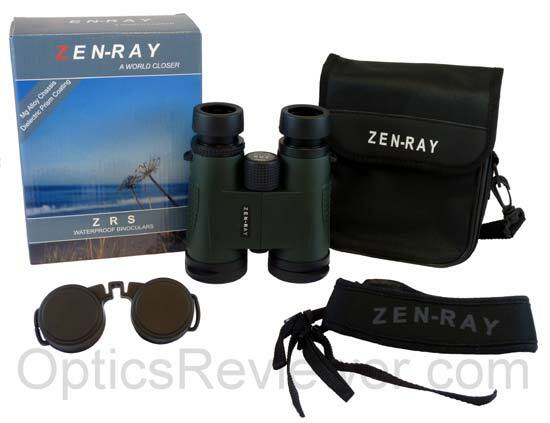 Where can you buy Zen-Ray binoculars? Our experience is that you'll find the lowest prices at Amazon. This link will take you directly to the Zen-Ray ZRS HD selection at Amazon.com . We are also selling our test binocular, featured in the pictures on this page, and you can check it out on our Optics for Sale page. 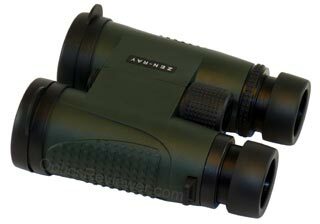 Updated August 2013: After publishing this review, we found that the Carson 3D ED price was reduced to about the same price point as the Zen-Ray ZRS HD and we felt our readers would be interested in a comparison between these two excellent binoculars. Please consider the Carson 3D ED vs Zen-Ray ZRS HD comparison if you're interested in binoculars at this price point. Is this Binocular Covered by a Warranty? What's the Warranty Like? Today's Zen-Ray ZRS HD is covered by a transferrable lifetime warranty. It's an excellent warranty and the reports which we've heard indicate that the company is quick to stand behind the product. Just contact the company if you have a problem.